Start-up businesses are creating hundreds of web services and apps to help governments, businesses, and organizations get more value from ArcGIS Online and their ArcGIS platforms. Their seamless software integrations extend GIS to a wider audience. Some of these new businesses are shooting to the forefront of the GIS market, and ArcNews will highlight a few in a new regular feature. These start-up companies below have developed apps used by local governments. MindMixer bolsters community engagement by bringing the town hall experience online. City administrators post discussion topics on an interactive engagement platform. Citizens give feedback on focused topics, from library hours to proposed transportation corridors. In addition, an aggregator gleans and analyzes concerns that community members have posted on social media. Three examples of MindMixer projects are My Downtown West by Calgary, Alberta, Canada; chiParks by Chicago, Illinois, United States; and ImproveSF by the City of San Francisco, California, United States. The MindMixer app integrates with Chicago's existing system to provide an interactive platform for community dialog. 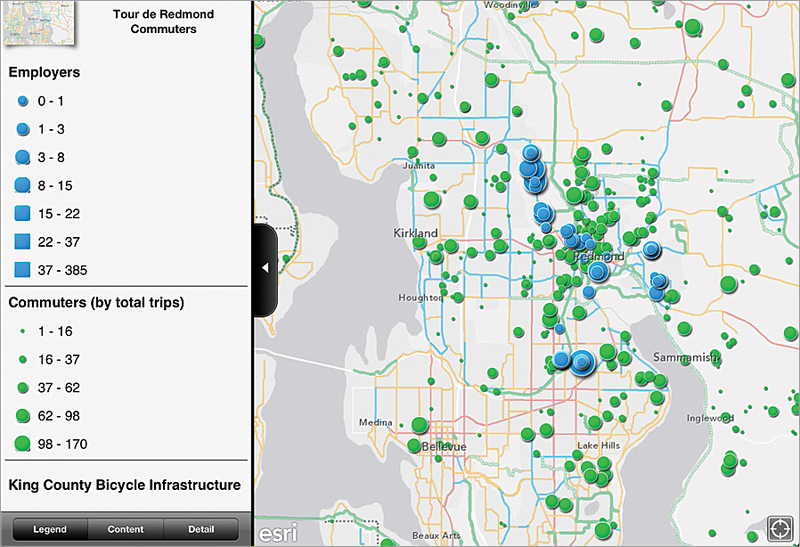 A RideAmigos map shows the King County Bicycle Infrastructure, the location of employers, and the total trips of commuters in Redmond, Washington. The RideAmigos app classifies fast, efficient, and affordable transportation options, including walking, biking, driving, public transit, and car pooling/vanpooling. A virtual dashboard displays commute options in terms of cost, time, carbon emission, and health benefits. Organizations use it to encourage health, reduce traffic, evaluate travel expenditures, plan trips, and more. Notable projects are GoMIO by Barcelona, Spain; ExperienceLA Integration by Los Angeles, California, United States; and the Tour de Redmond by Redmond, Washington, United States. The citizen reports a problem using a CitySourced app on a smartphone. City staff see a real-time map showing a reported incident. CitySourced invites citizens to identify concerns, such as potholes and graffiti, and use their smartphones to report issues to city government. The information comes into the city’s GIS, which shows the exact location of the problem in real time. CitySourced integrates with the city’s existing system. Some interesting CitySourced services are Harford County Connect by Harford County, Maryland; Can-Do Honolulu by Honolulu, Hawaii; and CitySend by Longview, Texas.